The Edmonton Junior Field Hockey Association is a registered non-profit organization in the province of Alberta that focuses on the development of youth programs in the City of Edmonton and across the Province of Alberta. It first began on April 1st, 2012 and was known as "The Green & Gold Junior Field Hockey Club" and was sanctioned by EJFHA and Field Hockey Alberta.. 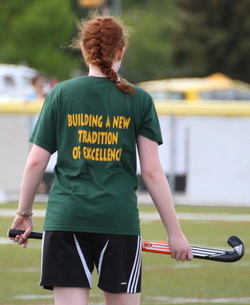 The Green & Gold Junior Field Hockey Club was organized by some of the former University of Alberta’s Pandas Field Hockey-Coaches, Athletes and Alumni. The clubs philosophy is to develop enthusiastic and talented field hockey athletes, coaches and officials in the Edmonton Region. The clubs goal is to facilitate athlete development and to identify as well as promote talented athletes to play at higher levels such as Provincial, University and National programs. We strive in developing young athletes to their full field hockey potential by providing creative & enriching sessions that are conducted in a challenging and dynamic training environment, based on the LTHD- Long Term Hockey Development training principles. In our club young athletes 7-18 years of age will learn the fundamental techniques and skills needed to be dynamic and creative on the field. The Club has qualified and trained NCCP coaches that are registered with Coach Association of Canada and have both University and National team experience. We strive for coach education and encourage all coaches involved in our club to become trained and certified coaches in the appropriate areas and follow Field Hockey Canada’s LTHD- Long Term Hockey Development Model. When registering with our club- each participant becomes a registered member with Field Hockey Alberta and Field Hockey Canada. As a registered member you will receive individual insurance in case of injury as well as updates from both organizations. Our club also registers teams in local leagues ran and sanctioned by Field Hockey Alberta for both the indoor and outdoor seasons. These leagues focus on friendly competition between local clubs and offers game-like experience to our members.